Tyler Carson’s undergraduate thesis titled “Toward A Queer Politics of Pride” has been selected as a highly commended paper for this year’s Undergraduate Awards. This distinction of highly commended means that he placed in the top 10% out of almost 4,800 entries. Tyler has been invited to attend and present his paper at the Global Summit in Dublin, Ireland. The conference takes place November 19-21, 2014. 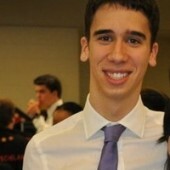 Tyler is an MA student in Women and Gender Studies at the University of Toronto. He holds a Social Sciences and Humanities Canada Graduate Scholarship for the 2014-15 academic year. His research interests include: affect; sexuality; epistemology; reparative reading practices; social and political thought; and the history and institutionalization of women and gender studies.